It shouldn't surprise anyone that new development is to form part of the level crossing removal projects. After all, it was only a few short years ago that the City of Glen Eira became the first council to implement the reformed planning zones. 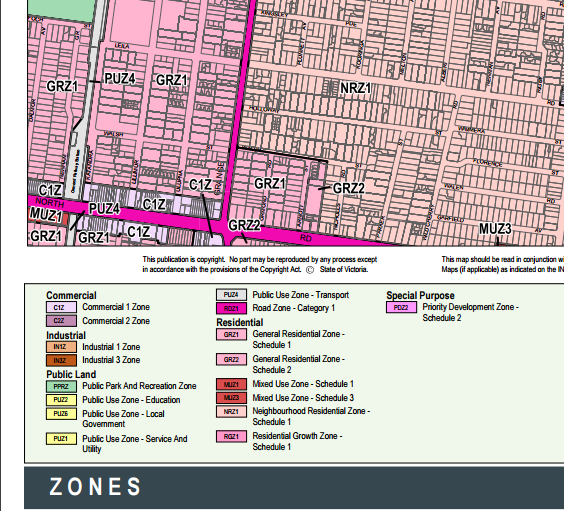 Glen Eira is the now infamous council that got in first, locked up a significant amount of its territory with the new neighbourhood residential zone and then proceeded to explain that it will help share the population growth of metropolitan Melbourne by focusing development into the small-scale residential growth and "high street-focused" commercial-zoned areas throughout the municipality. North Road at Ormond station, where The Age reported high-rises "at up to 13 levels" could be developed as part of a value capture mechanism, fits right into this zoning scenario. As seen above, the railway corridor is zoned Public-use Zone 4 (PUZ4) - which is the general land zoning for transport uses - and Commercial Zone 1 (C1Z) and Mixed-use Zone 1 (MUZ1) are either side of the rail line on North Road. The more pertinent question is: how will the land created by decking over the trench at railway station be re-zoned? Will it be a simple matter of "painting" the new parcel the same colour as those on either side of the railway corridor? Looking for an example of where a high-rise has fit into a high street setting? Look no further than in another part of Glen Eira, near Elsternwick station. The Element Elsternwick building, as seen in the Google Streetview below, was completed only a few years ago and has 11 levels - zoned C1Z. At the 2011 Census, only 48.8% of occupied dwellings in the suburb of Ormond were separate houses, down from 50.5% in 2001. Flats, units or apartments made up 35.8% of the housing stock and townhouses made up 14%. And looking at Glen Eira more broadly, the development pipeline points to the apartment figures rising substantially. We are currently tracking 72 projects in Glen Eira - combined, they have 3045 dwellings between them. The average number of floors in the development pipeline is a very unsuburban-like 4.6 with two proposals in Carnegie having 11 and 12 floors. Consequently, these two proposals are located in Carnegie's C1Z and MUZ1 north of the railway line. Back over in Ormond, there are four proposals - which combined have 120 dwellings - along North or Grange Roads. Two of those proposals are in GRZ1 (both 3 floors), one in C1Z (6 floors) and the remaining proposal in MUZ1 (5 floors). The two Carnegie and four Ormond proposals are linked below. One of the top developments in Carnegie is Laila Residences. Leila Road is not is the Residential Growth Zone???? I now realise what you mean by 'context' is not the low rise shops and suburban houses of the mediate area, but the context of similarly scaled things happening in similar places. The two large towers around Carnegie station are the most relevant, and will no doubt encourage more. My first reaction is that 13 storeys at ormond looks way out of scale, and that even with the grand width of North road, it doesn't leap out as an area that should become high rise. But if the commercial sites are zoned for high rise, I suppose more will follow, and voila another unplanned cluster. Though I don't suppose its a bad thing right here, just unexpected. As to Glen eira apartment figures, that's no surprise as caulfield was one of the suburbs that was filled with villa units and walk up flats in the 60s and 70s. the other thing that is worth pointing out is that this location is 3km from Caulfield which has existing 10-12 stories at Monash Uni, new 5-8 stories on the north side of Dandenong Road an under construction 17 storey at Dandenong/Tooronga, and proposals for 20-30 stories at the University and racecourse sites. Now clearly Caulfield is a different scale of centre but the people of Glen Eira and Ormond more specifically could hardly say 'theres nothing like this around here'. The Elsternwick example is probably actually further away from this location than Caulfield. Similarly Chadstone and Moorabbin two other locations with reasonable sized 'towers' are a similar distance from this location.